This isn’t the classic recipe for Beef Stroganoff. That one calls for quickly sautéing a tender cut of beef (like tenderloin) until it’s rare or medium, then making a rich mushroom sauce with cream and/or sour cream. But we think leftover roast or braised beef has a much deeper flavor, so that’s what we’re using. BTW, this dish is particularly succulent when made with leftover wine-braised beef Short Ribs or Pot Roast. Prep time for this dish is about 15 minutes. Cooking adds about half an hour. This dish yields 4 generous servings. Leftovers keep for a few days if refrigerated in an airtight container. Remove the leftover beef from its bone if necessary. Then cut the beef into slices of about one-quarter to one-third inch thick. Set aside. Wipe the mushrooms with a damp paper towel to clean them. Cut the mushrooms into halves or quarters. Set aside. Peel the shallots and mince them. About 10 minutes before the cream is finished reducing, start cooking the noodles. Taste the beef mixture, then adjust the seasoning if necessary. Remove the cooking pan from the heat and stir in the sour cream. Plate the cooked noodles, then ladle the beef mixture over them. Garnish with parsley and reserved mushrooms, if you wish. Serve and enjoy. In the US, this dish was at the height of its popularity in the 1950s and 60s. In those days, though, home cooks often used cream of mushroom soup (instead of fresh mushrooms and real cream). Using leftover roast beef that’s been cooked to rare or medium, and want to keep it that way? Don’t add the beef in Step 5. Instead, add it a couple of minutes before you add the sour cream (Step 7) and cook just long enough to heat it through. But keep in mind: Cooking the beef and mushrooms with the cream and stock or gravy will yield deeper flavor. BTW, when we have leftover roast or braised beef, we'll often freeze it to use later in a recipe like this. Many recipes use sour cream alone in this dish. We think heavy cream adds much more flavor, so we recommend using it. But do add sour cream to finish the dish – it gives great tang. Some recipes add mustard to this dish, which also adds zip. If you want to try this, just add a teaspoon or two of Dijon-style mustard when you add the cream in Step 5. Beef stock works fine in this recipe. But it tastes even better when made with leftover beef gravy or sauce. Some recipes add white wine to this dish. We haven’t tried that, but feel free to experiment. Use any kind of mushroom that you like in this dish. Ordinary white button mushrooms work well. We use dried thyme in this recipe because it pairs well with mushrooms. Fresh thyme works too – just double the amount we suggest. Fresh tarragon or dill would also be nice. Many recipes add paprika to this dish (usually a couple of teaspoons). We use kosher salt for cooking. It’s less salty by volume than regular table salt (the flakes are larger, so it doesn’t pack a measure as densely). If you substitute regular table salt, start with about half as much as we suggest. But always season to your taste, not ours. We like to serve egg noodles with this dish (preferably ones with a twisted shape). But use any kind of noodle you like. You can butter the noodles or not before serving. We usually don’t because this dish is already quite rich. We consider 2 ounces of dried noodles adequate for a serving, but increase that to 3 if you like. If you’re serving hungry teenage boys, you might want to make it 4 ounces. Don’t want to use noodles? You can substitute rice, polenta, or mashed potatoes. Garnish isn’t necessary for this dish, but we like the look of parsley, so we always use it. A few extra mushrooms on top also add a nice touch. Beef Stroganoff was probably first served in Russia sometime during the mid-1800s. When it first appeared, the dish didn’t include mushrooms. But we think mushrooms add a lot of flavor, so we’re glad the recipe evolved to include them. “Maybe they remember the canned-mushroom-soup version of yore,” said Mrs K R.
“Yeah, that dish could have used some beefing up,” I said. All can and no cattle, you might say. It looks really delicious, John! I love it with egg noodles and all those mushrooms, about the same way I make it. Next time, adding Dijon mustard would be great. Thanks for sharing! Hi Pam, mushrooms are wonderful in this dish! Dijon mustard is a fun variation, too. :-) Thanks for the comment. What a fabulous use for leftover pot roast! It's guaranteed to be full of tender beef (I've made shoe leather stroganoff a time or two). Hi Liz, good point about traditionally-made stroganoff sometimes having tough meat. Not a problem with this method! :-) Thanks for the comment. Don’t you just love leftovers to make a delicious dish like your beef stroganoff? For me this this is the perfect comfort food. Thanks John! Canned mushroom soup!! To think that some cooks still use it instead of real mushrooms! Somehow I was ahead of the curve on this one — started converting those recipes when they weren’t even retro yet. Your procedure sounds complicated and totally worth it. I keep thinking that Beef Stroganoff ( the not-canned version) didn’t deserve to fall into obscurity along with the stressful entertaining standards of yore. Great use of leftover beef. The stroganoff looks delicious. Hi Gerlinde, it really is terrific comfort food, isn't it? And a great way to use leftovers! Thanks for the comment. Hi Tricia, mmm, roast beef! Great first time around, and then used in leftovers -- in this dish! :-) Thanks for the comment. Hi Mae, when I was a kid, you almost never say fresh mushrooms at the grocery store. Or maybe there were there and I just didn't see them (I wasn't all that food-aware back then). Mushroom soup used to rule! This is better. :-) Thanks for the comment. Hi Pam, it IS delicious! Need to roast or braise beef again soon so we can have this again. :-) Thanks for the comment. I am salivatiing! I love Beef Stroganoff but can,t remember the last time I made it though. No leftovers right now but will make sure to have some soon. Hi Evelyne, once you make this, you'll probably find yourself making roast or braised beef often -- just so you can have this again! :-) Thanks for the comment. This looks droolworthy, John! 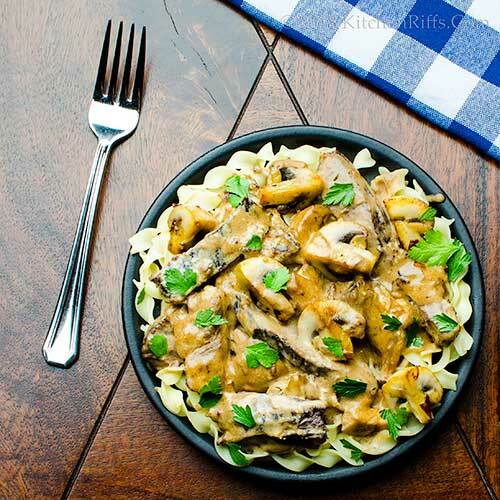 I haven't had stroganoff in ages..now I am really craving some! My parents always make a roast for Christmas and the leftovers last forever--I'm going to remember this recipe to use some of those leftovers up! It sounds fantastic! Hi Angie, it's been ages since we've made it too! Now can't wait to make it again. :-) Thanks for the comment. Hi Kelsie, hard to beat this recipe for leftover roast beef! Thanks for the comment. I haven’t had beef stroganoff in years but always loved it. Yes we use to use Campbell’s Cream of Mushroom soup - who didn’t? Love this recipe and that it takes me down memory lane. Great use of leftover beef. Hi Vicki, yup, Campbell's soup used to rule! I haven't made tuna noodle casserole with it in years, but that's actually a fun dish. :-) And this one is really wonderful! Thanks for the comment. Hi Deb, well, tacos are good too. :-) Although this is a nice change! Thanks for the comment. I love using the gift of leftovers to turn into something even more delicious than the original. And how can you go wrong with egg noodles and plenty of earthy mushrooms? Hi Carolyn, this actually IS better than the original dish. And that was pretty darn good! :-) Thanks for the comment. 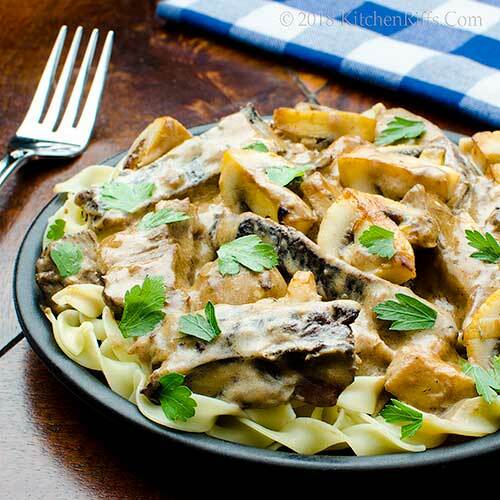 I'm crazy about beef stroganoff, so I love that you use leftover beef to make this. Hi Laura, beef stroganoff is such a good dish, isn't it? And leftover beef is terrific in it! Thanks for the comment. Hi GiGI, LOL! Well if you EVER do, you know what to do with them. :-) Thanks for the comment. I haven't had stroganoff in a long time! Thanks for bringing it back. It used to be one of my favorites. Great idea as a way to use leftover beef! Hi Izza, it was a pleasure both to make and eat this dish! :-) Thanks for the comment. Hi Jeff, great dish, isn't it? I think it's better made with leftovers! It's all about the mushrooms and sauce, anyway. :-) Thanks for the comment. Looks perfect! Comfort food at its finest! Hi Kelly, definitely fine comfort food. :-) Thanks for the comment. 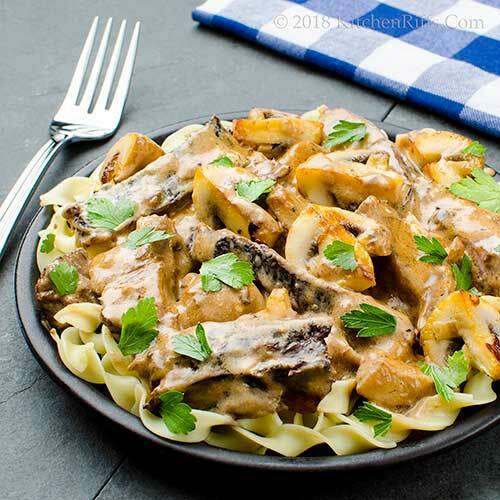 This recipe makes me hungry to try making Beef Stroganoff again! But your comment about using a can of mushroom soup in the recipe made me chuckle a bit. How I remember those days of opening a can of Campbells Cream of Mushroom Soup to make our various casseroles! Hi Fran, those cans were handy! And the good thing is, we ate dishes we probably wouldn't have without them. :-) Thanks for the comment. My mom used to always use leftover beef for a similar dish which I loved. I agree, it's the tougher cuts of meat that cook for a long time, that are the best (at least for this). And those lovely noodles -- together it's such a comforting meal. John - I have always loved beef stroganoff! Never thought of using leftover meat - quite brilliant if you, you know! Did people actually use canned mushroom soup to make this? What WERE they thinking?!? Hi Valentina, the tougher cuts of meat tend to have better flavor, don't they? I'll take flavor over tenderness any day! :-) Thanks for the comment. Hi David, that canned soup was HUGE in the 50s and 60s. This is better -- really good mushroom and cream flavor in this. Thanks for the comment. We have not made beef stroganoff in ages! Now you have us craving this. You know when you have leftover beef it is something that we don't always want to put in fried rice or soup so this is a delightful change. Hope you weekend is fabulous! Hi Bobbi, it's been ages wince we've had this dish, too. But I had some leftover beef in the freezer, and I've been craving Stroganoff, so this is the result. :-) Thanks for the comment. Can you think of a dish that isn't better when made with leftovers? :) What a wonderful way to use leftover beef. It's been years since I've had stroganoff and your pictures, as always, have me wanting some. I have a beef dish scheduled for the near future so I'm pinning this as an idea for the leftovers. Thanks John! Hi MJ, this tastes better made with leftovers than made the traditional way! :-) Thanks for the comment. Hi Greg, as much as the cool weather, it's the difference in the way the daylight appears that signals fall to me. The angle of the sun changes, and it's not nearly as intense. Plus, of course, days get shorter. :-) Thanks for the comment. How are you John? I'm jealous that your area is getting cooler for comfort food! Love this cozy dish, and it's interesting that cream of mushroom soup was used to make this dish before. Love reading those note sections of your recipes - learn quite a lot every time. Hi Nami, good to see you! A lot of people still make this dish with cream of mushroom soup! It's actually not bad at all, although this is much, much better. :-) Thanks for the comment. Hi Natalia, it IS perfect! :-) Thanks for the comment. Love stroganoff so much and my kids devour it. I never use cream of mushroom soup. We have been hit by cold weather and snow so it is indeed a recipe I will visit soon. Thank you for reminding me :). Hi Amira, it was 90 here last week, and now it's pretty chilly. But no snow yet, thank goodness! Thanks for the comment. 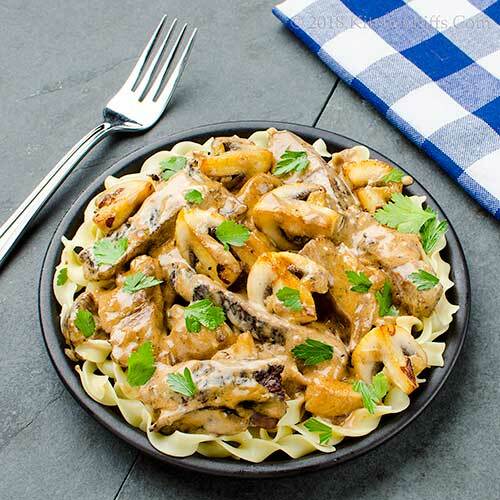 I have not had stroganoff for ages, and I love the idea of using leftover. It looks delicious John...have a wonderful weekend! I think this is still a popular dish. Perfect for fall! And stroganoff always makes everyone run to the table! Hi Juliana, one of those great dishes that's just not seen too much these days. Time to make it popular again! Thanks for the comment. Hi Abbe, hard to resist stroganoff, isn't it? Good stuff. :-) Thanks for the comment. Hi Marcelle, that cream of mushroom soup is addictive! :-) Thanks for the comment. I love being able to repurpose leftovers into a new delicious dish! Hi Amy, this makes the best leftovers ever. :-) Thanks for the comment. John, I was offline for a few days and missed this one--lovelovelove it! I'll be making it very soon! Hi Jean, this is a good one -- not one you want to miss. :-) Thanks for the comment. John, I was going through my backlog of unread posts and got to this one yesterday afternoon. As I read your post I remembered two things, first it was my night to cook. Ouch, I hadn't plan a thing. Second, I remembered we had a nice piece of leftover leg of lamb. Bingo, you gave me dinner and it was so good. We had all that I needed, but I had to make a couple of substitutes. Still had wild mushrooms, so we used them. Didn't have fresh thyme but had plenty of fresh. Finally, we don't have sour cream here, so I used Creme fraiche. A five-star quick meal. Thanks for sharing. Hi Ron, Creme fraiche would be wonderful in this! And love the idea of lamb -- I gotta try that. :-) Glad you enjoyed this. Thanks for the comment. We have a meal about once a week that features a leftover item of some sort. Your beef stroganoff with noodles is a terrific way to use leftover roast beef. Hi Karen, much as I love roast beef, this is better. :-) Thanks for the comment. This is a great way to re-purpose leftovers. Hi Emma, it is! And you can use so many different leftovers -- not just beef. :-) Thanks for the comment.